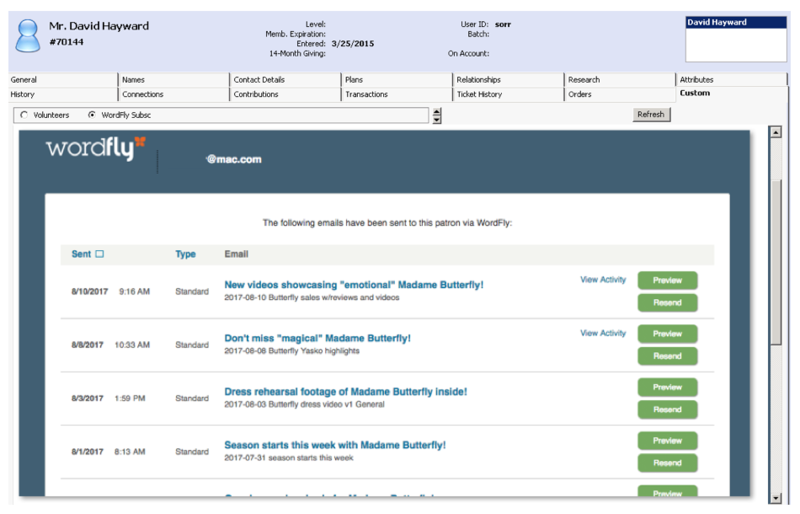 WordFly's integration with Tessitura includes a custom screen that can be set up on the constituent record and allows your team to see all the emails you've sent the subscriber and email responses. WordFly built a custom screen for Tessitura called Box Office Insight. The custom screen is available from the Custom tab of Tessitura constituent records. The custom screen shows all the emails you've sent the subscriber and their responses. We call this feature Box Office Insight since it is particularly helpful to staff fielding phone calls, general emails and front of house conversations with patrons. If a patron mentions an email they received in correspondence, the staff can review a copy of the email the subscriber received and see the open, click and other response activity generated by the patron on any email. The WordFly custom screen is available on Tessitura constituent records from the Custom tab. Users must log in with their WordFly credentials to access the custom screen. Tip: Set up a general WordFly login that all staff can use. The login does not need any permissions. As well as five of the most recent Triggered Campaigns that have been sent to the subscriber. Load more campaigns as needed. Email campaign name and subject line will display. Date and time the email campaign was sent from WordFly will display next to the campaign name. Select View Activity to see email responses generated by the subscriber through the email. You will see opens, clicks, and opt-outs here. You will also see the email client for the patron. Select the Preview button to see the actual email the subscriber received. The preview is live which means that opening the preview will register an open response and clicking any links will register click events on the subscriber's record. The preview will display any personalization included in the email. Triggered emails will always show the most recent data imported, even for previous triggered sends. For example, if your patron received a triggered reminder email on January 1st and again on January 15th, the preview for both dates will show the data imported on the 15th. When a patron does not have a customer number associated in WordFly there won't be any emails to display. The following message will appear on the custom screen: This customer is not associated with any subscribers in WordFly. When a patron has several email addresses associated with a record in Tessitura, a change link will appear at the top of the custom screen. Click change to select a different address. Select the Resend button to send a copy of the email to the subscriber. Email us for instructions on setting up the custom screen in Tessitura. Go to a constituent record in Tessitura to access the WordFly custom screen. 1. In Tessitura, search for the constituent. 2. Open the constituent record. 3. Select the Custom tab. 4. Select the WordFly Subscriber radial. 5. 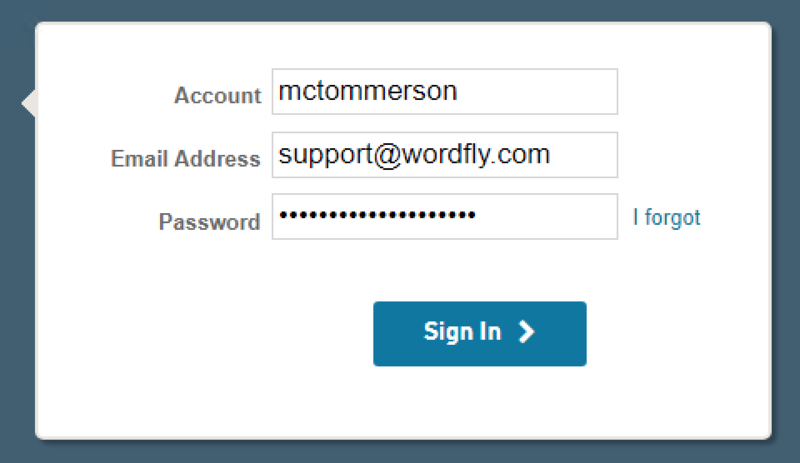 Log in to the WordFly custom screen. 6. Select the options on the screen to see the email and responses. Select Preview to see a preview of the email design. Select View Activity to see email responses. Select Resend to resend the email to the subscriber. You can easily resend an email to your subscriber from the WordFly custom screen in Tessitura. 6. Select Resend to resend the email to the subscriber. The custom screen does not load fully in Tessitura, what's going on? In some cases, most with RAMP hosted organizations, the custom screen preview does not load or partially loads for certain users (not all). To resolve: The issue appears to be connected to a default browser used by the client, if this isn't available to specific users open a TASK ticket with RAMP to request that Internet Explorer be made available to those specific users. The custom screen is installed but some users can't see it while others can, what's going on? 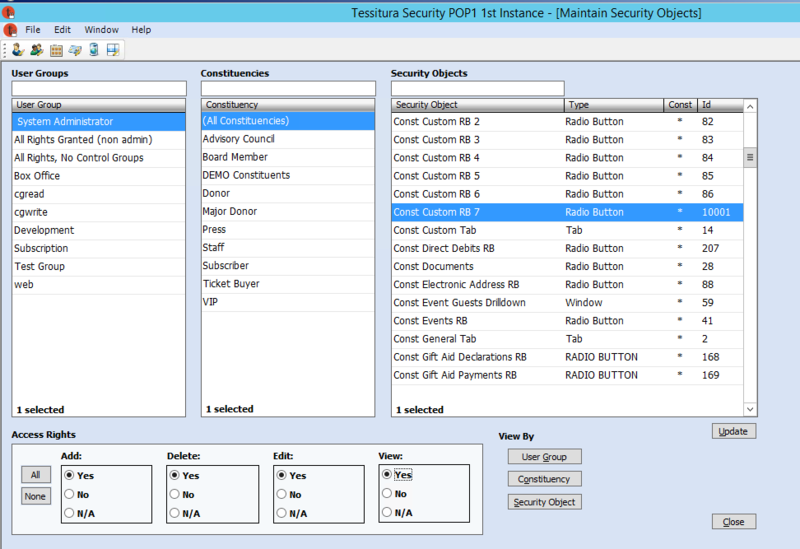 When the custom screen is installed there is a security context applied in Tessitura. Modifying the group security for the custom tab objects should resolve the issue. This change is done in the security application. 1. Login to the Tessitura security application. 2. Go to Maintain Security Objects. 3. In the User Groups column (left column), identify the appropriate User Group that isn't seeing the custom screen. Select this user group. 3. In the Constituencies column (middle column), choose (All Constituencies). 4. In the Security Objects column (right column), select the WordFly custom tab object. You can identify the WordFly custom tab object item by the object ID in System Tables TR_Custom_Tab. In the screenshot below the WordFly custom tab object is ID 10001. 5. For the permissions, make sure the group has Access Rights set to Yes for Add, Delete, Edit, and View.